Blocks are a clever way to add a decorative pattern in a crochet fabric without any tricky stitches. 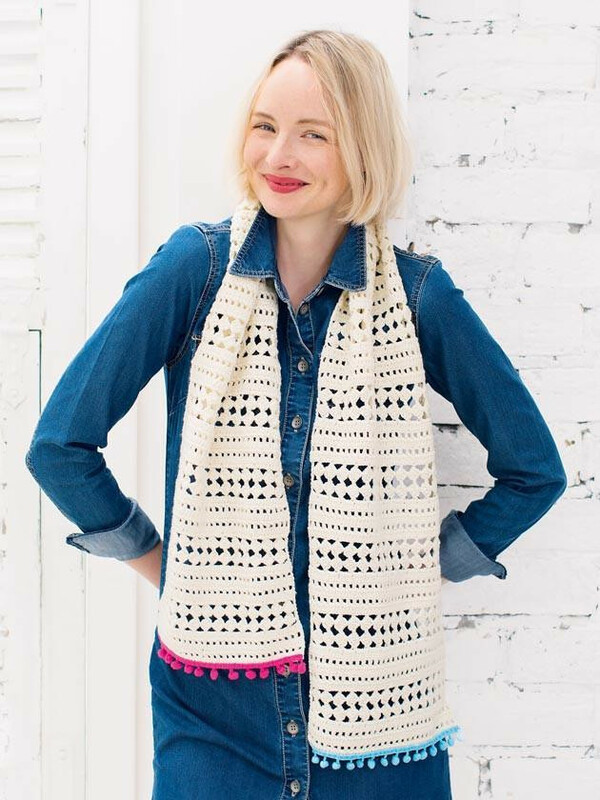 On our Striped Scarf With PomPom Trim Crochet Pattern, rows of blocks are used to create a stylish striped effect. The example blocks below are worked using a combination of chains (ch) and UK double treble (dtr) stitches. In US abbreviations, a double treble (dtr) is referred to as a treble (tr) so always make sure you check your pattern first to be sure which stitch is intended. Our patterns all use UK abbreviations. 1. On a mesh base of trebles separated by two chains, start the row of blocks with three chains (counts as one treble), * make a double treble in the next treble, then make four chains. 2. Working each around the post of the first double treble, make five double trebles. Missing one treble of the mesh base each time, repeat from *, ending one treble to match the three chains made at the beginning of the previous row. In order for the above pattern to be applied into your work, you must start with a multiple of three stitches plus one. For example, (10 x 3) + 1 = 31 sts. To establish the chain mesh base as suggested above, simply work 3 chains at the beginning of the next row followed by a repeat of 2 chains, missing two stitches below before working a treble. Repeat this until you reach the end of the row. You can work this mesh for several rows or just the one. Alternatively, an entire row of double trebles or trebles would also work just fine. Use the same multiple of stitches, but make sure to count the stitches below very carefully. The bonus with working on a mesh is that the trebles in which you need to work are easily identifiable, as they are separated by chain gaps and spaces. Finishing with a row of blocks creates a pretty decorative edge to any project. Try it on our Chair Topper Crochet Pattern.